Some of the most renowned New York doctors rely on the nutritional guidance of Dr.Joel Fuhrman whenever they have a patient whose life depends on losing weight fast. Fuhrman claims that dieters who have tried other diets and failed to lose weight will achieve success on his plan with promises of weight losses of up to 20 pounds within six weeks. The basic concept is centered on the idea of nutrient density that is expressed by the formula Health=Nutrients/Calories. Fuhrman says that our health is directly related to this ratio. 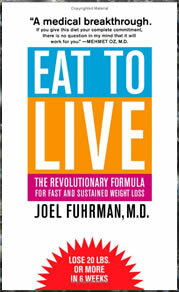 In his book Fuhrman provides two plans for weight loss. An aggressive six-week vegetarian plan for dieters who want to lose weight quickly. A more moderate plan that allows the intake of limited amounts of animal products. If dieters feel they must have some animal products on the plan they are permitted to have one serve of lean fish such as flounder, sole, or tilapia once per week and one egg white omelet per week. There is no requirement to count calories or portions, however, it would be very difficult for dieters to achieve a high calorie intake so long as they follow the recommended guidelines. Raw vegetables in unlimited amounts. Fuhrman advises dieters to regard salads as the main dish. Cooked green vegetables, eggplants, peppers, mushrooms, tomatoes. Starchy vegetables such as potatoes and corn as well as whole grains are limited to one cup daily. When oils are included in meal plans the maximum amount recommended is one teaspoon per day. Dieters are advised to aim for an intake of at least 1 pound of raw vegetables and one pound of steamed vegetables daily. Look for other vegetarian and non-vegetarian recipes here. Fuhrman advocates the importance of exercise however if the ability to be active is limited due to health issues then his aggressive menu plans will still allow dieters to lose weight without exercise. Regardless he does also state that almost anyone can exercise and even if dieters are unable to walk it is still possible to do light arm weight exercises or use an arm cycle. Try these exercises with the Eat to Live Diet. There may be an increase in the weekly grocery bill due to the extremely high intake of fresh produce that is a requirement for this diet. 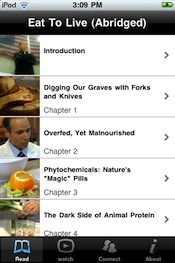 There is also an iPhone, iPod, and iPad version of Eat to Live via Vook. This allows you to take the book anywhere and can be very helpful when eating out or while shopping to have all the concepts of the book at your finger tips. This is an abridged version of Fuhrman’s book, so only the essential information is included for easier reading. This app is handy even if you already have the book or borrowed it from the library or a friend since it highlights only the important essentials. Educates dieters with information so that they are able to make informed choices regarding healthy dietary choices. High nutrient and low calorie diets may increase longevity. Promotes the intake of fresh fruit and vegetables (at least two pounds of vegetables and four serves of fruit daily). Reduces risk of and may actually reverse diseases associated with aging such as diabetes, cancer and cardiovascular disease. Beneficial for individuals who need to lose weight quickly in order to prepare for surgery. Includes menu plans and recipes with both vegetarian and non-vegetarian options. Extremely restrictive which may make eating out very difficult. Requires a fair amount of time spent on food preparation. May not provide adequate protein for many dieters especially those who are very physically active. Some dieters such as those with inflammatory bowel disease may not tolerate the large amounts of raw vegetables and fruit. Many dieters would probably not enjoy eating this way. Dr. Fuhrman’s diet plan is very extreme, however, it is well supported by scientific research particularly in regard to its potential benefit for dieters with high cholesterol, diabetes and cardiovascular disease. It is however important to be aware that not everyone responds favorably to this approach and some dieters achieve more beneficial results when they include larger amounts of healthy fats and protein in the diet. I love the book and I live by it now. I have lost 12lbs. and love my new weight. I plan on losing 5 more and will be where I want to be. I eat everything I used to eat except I stopped eating fish. I never ate meat anyway, but I get plenty of protein from beans. I have told almost everyone I know about this book. I love it. I feel great, I look great, and I know my health is great. Interesting, never heard of this lifestyle before….even though me and my SO are living it since 4 years. We feel younger, look younger, and enjoy life to the fullest! This really is a great way of eating. I agree with Kathy in that I feel like I have found a miracle. I saw Dr. Furhman on the Steve Adubato show (NJ), and went out and bought the book. It’s the first such book I’ve ever read or purchased, and I really feel like it’s the only one I’ll ever need. I feel like I got so lucky to have this be my introduction to healthy living. I also agree with some others that it may seem restrictive at first, but what once was looked upon as a restriction I now view as a pleasure. Read this book, follow it, you will lose a lot of weight and be healthy. Who wrote this summary? If you read the book it shows how much protein is included in the typical day’s diet, it is more than sufficient. Dr. Furhman says in his book that he himself ate this way while skating competitively…athletes need more of all nutrients, not just protein. They will eat a larger volume but in the same ratios as described above, and the balance remains. In my search for nutritional health I accidentally came across this book. It made such good sense to me, I decided to give it a try. During the first week I lost 7 pounds – that’s right, one pound per day – and I didn’t feel deprived. It is now the three week mark and I have lost a total of 11 pounds and am feeling great. I honestly feel like I am getting younger. My skin looks better, I feel more energized, and I am inspired to remain healthy. I will be 42 in two months, and I knew I wanted to do something to make sure I live a long healthy life for my children. I feel like I have found a miracle. I was 144 pounds and will have reached my goal when I am 125. Eight more pounds to go. For the longest time I didn’t think it possible – now I know better! I am so angry with our country and culture for teaching us to eat in ways that are literally killing us. My kids will know better! Thank you Dr. Fuhrman. I’m a 50 yr old man who has been on this diet (although I don’t call it a diet, I call it a lifestyle change) for over a year now. I lost over 25 lbs and am now at my ideal weight and BMI. I never go hungry nor starve myself, this diet lets you eat all you want so long as it’s on the healthy food list. It was a big adjustment at first, and I still spend much more time preparing and eating meals than before, but I really feel this is the way we were “meant” to eat, and I enjoy it. Even allowing myself occasional small “cheats” that are not advocated by the diet, I still am getting great results, and my doctor has cut my cholesterol medication in half. This diet may come across as “restrictive” only to the standard American who has grown up on disease promoting foods– ME! But truth be told- this diet is for real! Animal products consistently lead to ill conclusions in studies that pertainin to heart disease, lung health, hormonal disorders, acne, fibromyalgia, MS, diabetes, and probably more! Are we intended to consume them? Do we have carnivoristic biological claws, jaws? Is drinking the milk of a foreign species natural? These things need to be considered when dieting. This diet outlines the way we were likely naturally intended to eat.